Good Sunday morning. An upbeat O.J. Simpson was picked up by a friend when he walked out of prison in Nevada just after midnight, after serving 9 years for kidnapping and armed robbery. A corrections official told CNN: "I told him, 'Don't come back,' and he responded, 'I don't intend to' ... He was upbeat, personable and seemed happy to get on with his life." "It was quiet. No military air traffic control units on the tarmac directing planeloads of aid supplies, no bustling command center sending convoys of trucks to hard-hit areas." "I covered Hurricane Katrina in 2005 and the Haiti earthquake of 2010, among many natural disasters over the course of 30 years in journalism." 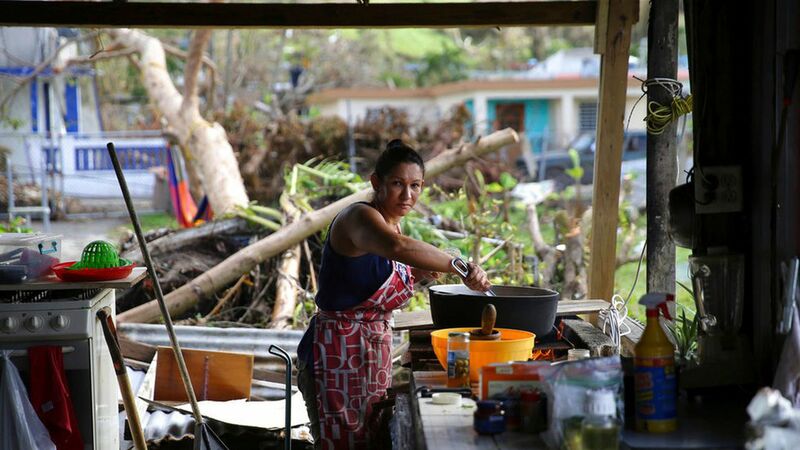 "Disasters on the scale of Hurricane Maria are usually marked by the inspiring sight of thousands of military and federal emergency personnel flooding into the affected area. Navy ships offshore, dozens of helicopters and cargo planes flying overhead, military convoys heading into affected areas." "Twenty-thousand troops were sent into New Orleans after Hurricane Katrina flooded the city and surrounding areas. Thousands of foreign aid workers rushed into Haiti after the earthquake there leveled Port-Au-Prince, the capital. Within three days of that quake, the U.S. had dispatched some half-dozen ships and 5,500 soldiers and Marines. "In San Juan on Sept. 22, the only sign of relief efforts were beleaguered Puerto Rican government employees struggling to address the multitude of problems confronting the devastated island, while coping with their own losses from the storm." Go deeper ... Fascinating N.Y. Times photos and gritty reporting, "Enduring a Day of Misery in Puerto Rico's Ruins: 24 Hours of Despair And Determination On a Battered Island." Tonight concludes Yom Kippur, the holiest day of the year for Jews when we reflect on the past year and ask forgiveness for our mistakes. For those I hurt this year, I ask forgiveness and I will try to be better. For the ways my work was used to divide people rather than bring us together, I ask forgiveness and I will work to do better. May we all be better in the year ahead, and may you all be inscribed in the book of life. "[W]ith few exceptions, the commercial air system used by millions of Americans every day is appropriate, even for very senior officials." "Therefore, all travel on Government-owned, rented, leased, or chartered aircraft, except space­ available travel and travel to meet mission requirements (as those situations are defined in Circular A-126) shall require prior approval from the White House Chief of Staff. "People are living longer, more expensive lives, often without much of a safety net. As a result, record numbers of Americans older than 65 are working — now nearly 1 in 5." "Today, 9 million senior citizens work, compared with 4 million in 2000." Why it matters: "Polls show that most older people are more worried about running out of money than dying." What's new: "A specially trained unit of Islamic State pilots flew small quadcopters and model-plane-sized drones, sometimes a dozen or more at a time, to stream live video of U.S.-backed ground forces and to drop crude munitions on them in both Iraq and Syria." Why it matters: "By evading ground defenses with remote-controlled devices purchased on the internet, the militants pioneered an asymmetric but successful tactic on the battlefield, much as the growing U.S. fleet of missile-firing Predator and Reaper drones has dramatically changed modern warfare." What's next: "The threat spurred the Army to issue a handbook in April to urge commanders to assign dedicated observers to track small drones, and to train soldiers in what it called 'Counter-Unmanned Aircraft System Techniques.'" When "Sarah Huckabee" tells "President Trump" (Alec Baldwin) that San Juan Mayor Cruz is on the line: "I was expecting this phone call. I'm sure she wants to tell me what a great job I'm doing." Then he tells the mayor: "You should have paid your bills. FEMA takes a few days unless you join FEMA Prime." "Ma'am, I don't know if you know this, but you're in an island in the water the ocean water big ocean, with fishies and bubbles and turtles that bite. We want to help you, but we have to take care of America first." "Weekend Update" on Hurricane Maria, with a drop-by by German Chancellor Angela Merkel (Kate McKinnon).